New American Home in Las Vegas real estate will save nearly 75 percent energy of similar homes in the area. The energy efficient homes by Blue Heron builder are a semi custom luxury home community in The Marquis Las Vegas. The National Association of Home Builders International Builders’ Show will be held in the Las Vegas Convention Center during January 20 – 23, 2009. This Las Vegas home will feature the latest green technology and valued near $4 million. More builders are going green and offering buyers alternative residential real estate. This project surpasses green building guidelines and is a certified Green Building project. The Marquis Las Vegas community is located in southeastern Las Vegas, Nevada with 14 half-acre lots. Prices start at $1.1 million up to $5 million with luxury one to four story homes for sale. These have some of the largest floor plans with 4,600 square feet up to 10,000 square feet. The unique home design with 56 photovoltaic solar panels generates 12 kilowatts of electricity, more than it will use in a year. The Net Zero home produces more energy than it consumes and will receive credit from Nevada Power for sending power back to the power grid. 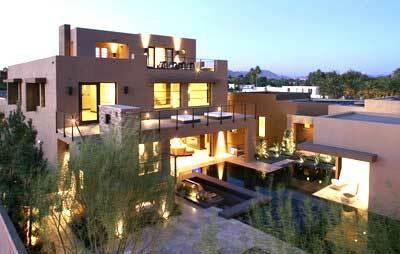 Luxury New American Home in Las Vegas will save nearly 75 percent of energy costs.